While I discuss that gravity applies to all. There is a very interesting phenomenon called gravitational lensing where a fat mass, an enormous gravity can bend light. 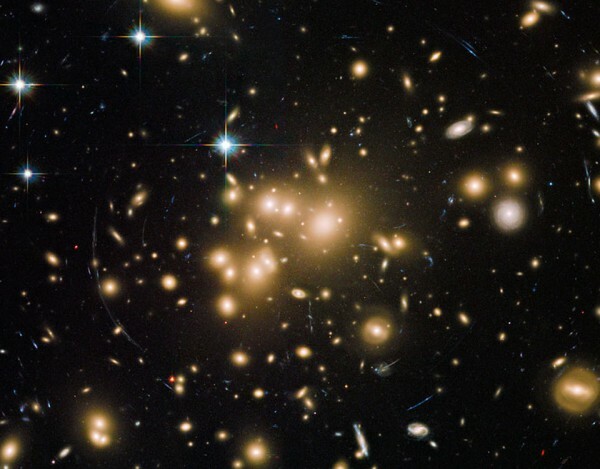 This can be seen in some galaxies like Abell 1689 (the image) is no more than a group of galaxies very close together and, therefore, warp space with its severity. Remember called “gravitational lensing” because, to bend light make a lens effect. Anyone who knows a minimum of photography will find that the picture is typical curved areas and a lens aberrations. This phenomenon is part of what Einstein predicted (not just said what E = mc ^ 2, beatings) about his theory of gravity and full string theory where the carrier of energy are waves. Even with that, gravitational lensing need several things. The first is space between the massive area and the observer to realize that light is bent and second, they need only as much mass to the mass of galaxies (about if) this phenomenon is not explained. So what Sheldon, the only thing left at this stage of the game is to think about dark matter. That is, that gravitational lenses were one of the things we have explained that dark matter exists. You know that stuff “must be there” because it generates around all the things that do matter but has not been detected because no radiation. Interestingly, although it has not seen and not knowing well that is the dark matter, as the law works in this universe, there must be the “anti dark matter”. Something that has not been, is not known, but it has to be.